Because of everything the Bay of Islands and Northland has to offer, including the beautiful beaches, watersports, stunning weather, and diving opportunities, the area is popular with tourists from around New Zealand and the rest of the world. But you may not realise that it’s also famous for some world class golf courses. Many with a view! In this guide we bring you the best greens up here in Northland and the Bay of Islands. Make sure to book in advance over summer – and don’t forget sunscreen and a camera. The heart of Aotearoa, Waitangi is where our nation of New Zealand came into being. Where else in the world could you play 18 holes in gorgeous sunshine, overlooking sites of such historical significance and natural wonder? The back nine of the Waitangi Golf Club offers you stunning views over the Bay of Islands towards Russell, the Nine Pin and Black Rocks, so you have every excuse taking your time back to the Clubhouse. Visitors are always welcome at Waitangi Golf Club, and the 18 hole course offers challenges for players of all skill levels. Narrow fairways and small greens can make Waitangi a challenging course, add to that winding your way through native New Zealand bush and multi-million dollar views over the bay itself and you have a course you’ll want to spend all day on. Access isn’t an issue. While it may be a bit far to walk with your clubs from Paihia, it’s only a short 15 minute drive from the waterfront up past the Waitangi Treaty Grounds. It’s a little bit further from Kerikeri. The short 25 minute drive following the scenic Haruru Falls Road is worth the view. Just follow the road around until it becomes Tau Henare Drive and you’ll find yourself at the Waitangi Golf Club. Because this course is so close to the tourist hot spot of Paihia, it’s highly recommended you book a tee off time, and as far in advance as you can. Even so, the staff are friendly, relaxed, and happy to help you however they can. The Clubhouse and ProShop are open daily, so you can really make a day of your time at Waitangi. So whether you want to hire some clubs and head straight out onto the green, spend some time working with a professional to hone your golfing skills, or relax with a drink at the end of your round, you can do it all at the Waitangi Golf Club. For a five star golfing experience, look no further than Kauri Cliffs. This golf course is ranked among the top 40 by Golf Digest Top 100 Greatest Golf Courses in the World, and for good reason. You’ll play along cliffs which plunge towards the Pacific Ocean, natural forest and kiwi farmland. As a resort, you can stay on site with the luxury of doing it all again tomorrow. As a destination course, Kauri Cliffs offer a premium level service. If you’re staying in Pahia and wish to golf at Kauri Cliffs, they can schedule a car to collect you and drive you the scenic 45 minute route, delivering you to the Pro Shop. 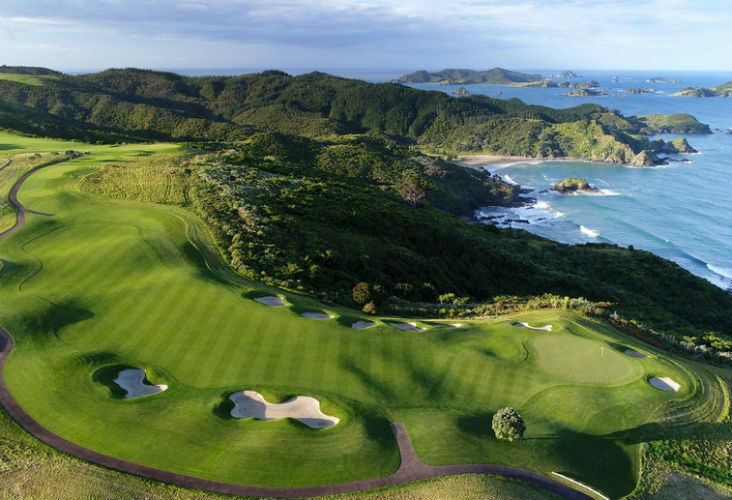 For faster travel that allows you to see more of the countryside, the Kauri Cliffs’ EC-130 Eurocopter can take you and five friends from Paihia to the green in 10 minutes (weather depending). As a luxury resort, Kauri Cliffs can provide you with everything you need to make your day more enjoyable. From club hire to trundlers, golf carts to caddies, just let the staff at Kauri Cliffs know what you’d like and it will all be waiting for you on arrival. In addition to 18 stunning holes, Kauri Cliffs offers golfers a practice range, putting and chipping greens, so you can get warmed up before starting to keep score. If your partner doesn’t play golf, they can relax at the day spa, and be waiting for you at their award winning restaurant and bar when you’ve sunk your final ball for the day. 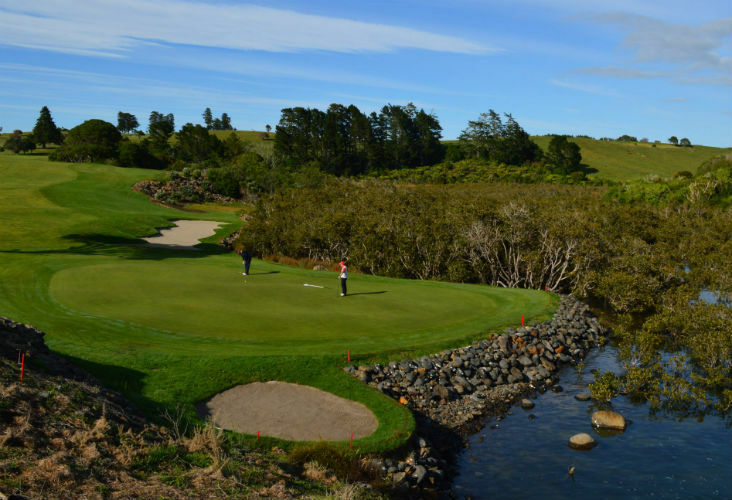 Bookings are essential for playing at Kauri Cliffs. Green fees for Kauri Cliffs vary depending on whether you’re visiting during the busy on-peak or off-peak seasons. 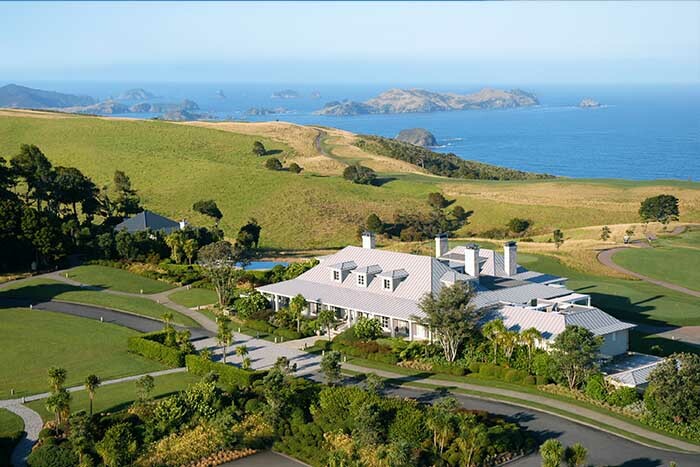 Plus, all guests staying at Kauri Cliffs Lodge receive a 10% discount off a round of 18 holes. Just a short drive from the centre of town means this stunning course is also known as the Kerikeri Golf Club. Very conveniently placed if you want to book 9 holes in for a morning and be at the beach by the afternoon. If you want to take some time away from your family or significant other, there is plenty close by to keep them occupied while you spend your day on the fairway. On top of the sub-tropical climate you can expect all over Northland, Kerikeri’s golf course is built on porous volcanic rock. Combined with couch fairways, this course is playable all year round, even in the warm and wet winters. Visitors are always welcome, although it’s advisable to book as far in advance as you can. 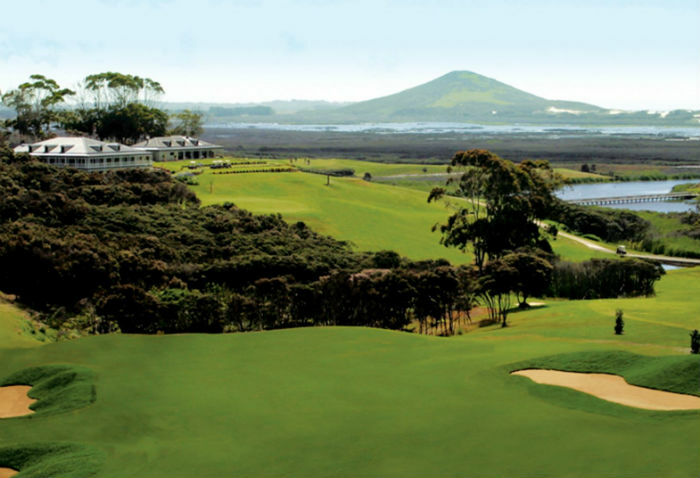 Kerikeri hosts a number of tournaments and inter-club golf competitions. While visitors can take part, numbers are limited so you need to book to make sure you get a place. Plus, their proximity to the Kerikeri town centre means this golf course is very popular with tourists and locals alike. Whether your aim is competition or relaxation, this course has something for everyone, and all levels of ability. The Golf Shop has clubs for hire, in case you weren’t able to pack yours with everything else. To make your day out even more relaxing, the Bay of Islands Golf Club has carts available for hire, so you can cruise the course in comfort. With long, tree-lined fairways and a championship layout, it’s sometimes hard to believe how close the Bay of Islands Golf Club is to the Kerikeri township. Having spent your time on the back nine, take the chance to relax with a drink at the Golfview Cafe. Look out over the course from the balcony, and replay the highlights from your day. Towards the North of Northland, lies Carrington Golf Course. Around a 90 minute drive from Kerikeri to the Karikari Peninsula, which sweeps around the top of Doubtless Bay. This incredible golf course is part of the luxurious Peppers Carrington Resort. There is something for everyone at Carrington Golf Course. From one of New Zealand’s longest par 5 courses at 569 metres, to one of the shortest par 3’s at just 113 metres, Carrington is designed for golfers of all skill levels. If you’re traveling without your favourite set, Carrington offers golf club and cart hire, so you can make a day of this stunning championship course. The views from the Carrington Clubhouse at Peppers Resort are second to none. Set on a high ridge in the middle of the golf course gives you stunning views of Northland’s beaches, wetlands and native bush wherever you look. 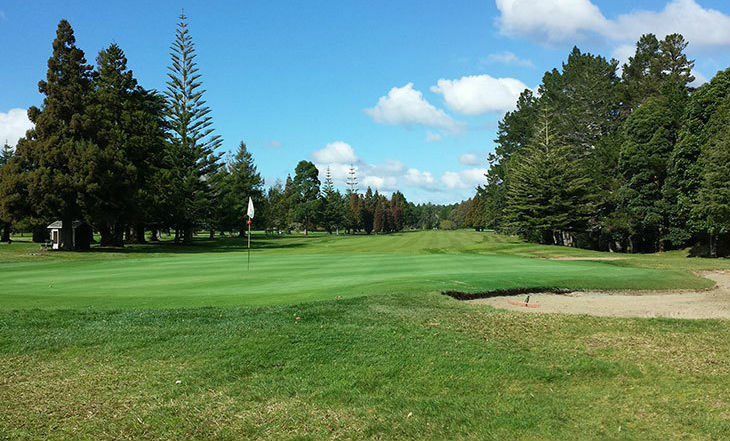 As Carrington is off the popular tourist track, and away from the popular sites of Paihia and Waitangi, you may find playing here more relaxed with less pressure to make your way through the course. Because of this, booking a teeing time is recommended, but not essential. Although you may want to book into the resort to extend your stay in this beautiful Northland spot. As well as a few rounds of golf, you would also have opportunities to take in a tour of the local winery or restaurant. Rental or hire car is the easiest way to get to and from Carringtons. This also allows you to take in the other local courses, in case you wanted to see whether the grass really is greener. If you’re planning on coming to take advantage of the summer climate in December, January and February, make sure you book everything well in advance. Your accommodation, your tee-off times, and any transport arrangements will need to be booked ahead of time to avoid missing out. Paihia and the Bay of Islands are especially popular as a destination for New Year’s celebrations, so bear that in mind if you’re thinking of playing golf over summer. Towards the end of January, the Bay of Islands will become less busy as locals start heading back to work, which means February can be ideal for teeing off in beautiful summer weather while avoiding the peak tourist crowds. No sooner has peace and quiet reached the Bay of Islands before it becomes very busy again. Waitangi Day, New Zealand’s national day, is February 6th. The Prime Minister, politicians, dignitaries and people from around New Zealand will once again descend on the Bay of Islands to commemorate Waitangi Day. Like the Christmas and New Year period, accommodation may also be harder to come by at this time. It’s unlikely though the extra people in the Bay of Islands for Waitangi Day will be heading to the golf courses, so if you can book a place to stay, it shouldn’t affect your ability to play. There’s a reason the Bay of Islands is known as the ‘Winterless North.’ Even in June and July, temperatures are usually between a balmy 10°C – 17°C, making golfing an activity that can be enjoyed all year round. While it may be warm, watch out for wintery showers. Nobody likes teeing off from a sodden green, so keep an eye on the weather forecast before heading out. Summer presents a different obstacle, with temperatures climbing as high as 35°C in December and January. Make sure you bring plenty of sunscreen and make sure you stay hydrated. You have a few options if you’re looking to travel here. Coming in from overseas or wider New Zealand, Auckland Airport is your gateway. If you’re hiring a car, driving to the Bay of Islands will take you a little over three hours from Auckland, but you should factor in rest breaks and selfie-stops along the way. To reduce your travel time from three hours down to one, you can catch a connecting forty minute flight from Auckland to Whangarei Airport. As a regional airport, there will be fewer flights available, so factor that in when booking your trip. If you would prefer flying straight to the heart of the Bay of Islands to start your golfing holiday, Air New Zealand can take you directly to Kerikeri Airport. From there you can taxi to your hotel, or hire your rental car. As there are limited public transport options around the Bay of Islands, a rental car may be the most effective option for transporting yourself and your golf clubs around our region’s different courses. Because there aren’t many taxi’s or rental cars in Northland, again, we strongly recommend you book your transport options before you arrive to make sure you get the chance to visit everywhere you want to go. So grab your clubs, your caddy, and get ready to tee off from some of New Zealand’s, and the world’s premiere golf courses, tucked away in our corner of paradise.